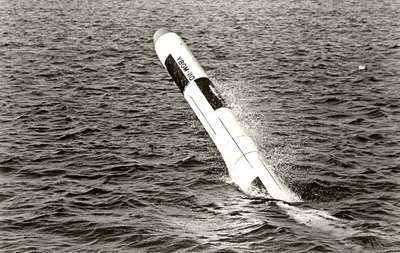 The ZBGM-110A was one of the two finalists in the U.S. Navy's SLCM (Submarine-Launched Cruise Missile) competition of 1974/76. 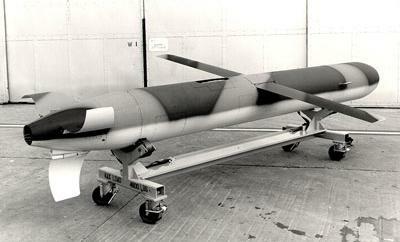 The other one was the General Dynamics ZBGM-109A, q.v. for further details about the SLCM program. The first attempt in February 1976 to launch a YBGM-110A prototype from a torpedo tube failed because of a tube malfunction, and on the second attempt, the missile's wing failed to deploy. Because the YBGM-109A had performed flawlessly on two launches, and was the less risky overall design, the U.S. Navy declared the BGM-109 the winner of the SLCM competition in March 1976, thus ending the BGM-110 development. The YBGM-110A was powered by a Teledyne CAE Model 471-11DX turbofan engine and a solid-propellant rocket booster for launch. An unusual feature was its one-piece fiber-glass wing, which was stored longitudinally in the fuselage, and pivoted through 90° to protrude through slots high on the fuselage sides. The tail surfaces were three curved fins, which lay flush on the round fuselage before deployment. Before the BGM-110 development program was cancelled, the designations YBGM-110B (for an anti-ship missile, equivalent in purpose to the BGM-109B) and YAGM-110A (for an ALCM version) had been reserved for projected variants.